Sunshine, flowers, bunting, marquees and bowls full of delicious sweets and treats are what this colourful-yet-understated invitation conjures up for us! If you’re planning a sweet and sophisticated wedding, this lovely invitation from Norma & Dorothy will be sure to get your guests in the celebratory mood! 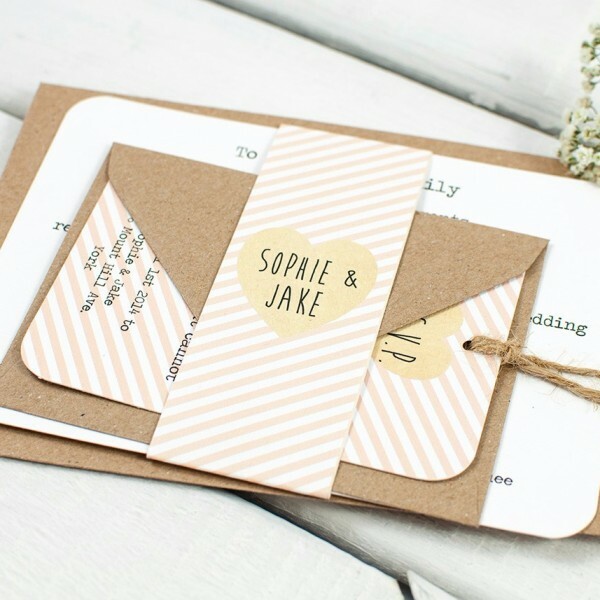 The beautiful stripes feature throughout this wedding suite, with the wonderful and thoughtful belly band being the first eye catching glimpse into your wedding for the recipient. Once removed, they’ll have access to the similarly designed RSVP card complete with envelope, plus the simple-yet-striking wedding day details, all of which are professionally printed onto luxury 280gsm textured base card. We think it’s the little details that make this invitation so special, including the perfectly romantic heart and pearl that feature in the centre of the wedding day details, the rounded corners that give the entire package a soft, gentle feel, plus the fun and funky reply options that adorn the quirky RSVP card, not to mention the hand-tied twine! If you’ve fallen in love with this beautiful and striking invitation (and let’s face it, who could resist) but the colour doesn’t quite match your intended wedding theme then fear not, for all of the colours can be customised, as can the wording throughout the invitation for that bespoke and couldn’t-be-more-perfect feeling! Regardless of the style of wedding you’ve chosen or what time of year you’re holding it in, we think this unique and delightful wedding invitation will perfectly showcase your personalities, whilst emanating your love for one another in the run up to your special day! Tags: Bunting, Candy Stripe, Peach, Summer Fete.